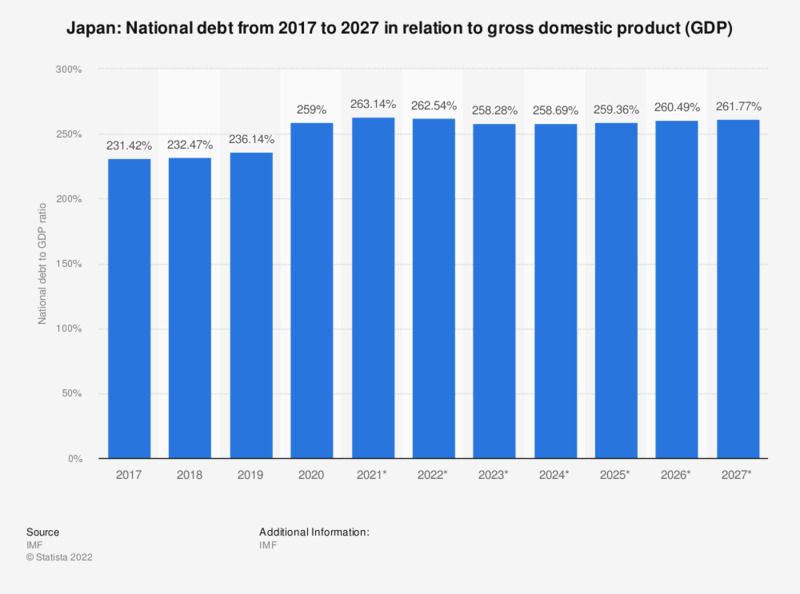 The statistic shows Japan's national debt from 2012 to 2016 in relation to gross domestic product (GDP), with projections up until 2022. In 2016, the national debt of Japan amounted to about 235.59 percent of the gross domestic product. Japan’s national debt ranks first among countries with the highest debt levels in the world, far surpassing the debt levels of Greece - which ranks number two - whose financial crisis has been in the spotlight recently. Italy is third, followed by Jamaica, Lebanon and Enritrea. Currently, Japan’s national debt amounts more than a thousand trillion yen and the country’s debt is predicted to keep rising for the foreseeable future, albeit only slightly. Japan’s national debt is not without consequence for the global economy, because the country claims the fourth-largest share in global gross domestic product. Therefore, the effects on the global economy would and could have a much greater global impact than that of a country such as Greece - considering its share of the global economy adjusted for purchase power parity was less than 0.29 percent in 2011. The debt levels of China, the United States and India should also be watched closely as they together make up the largest share of global GDP. At the moment, Japan’s inflation rate is among the lowest in the world, but as Japan attempts to reduce its national debt, this could change.